The Department of Germanic Languages and Literatures is an interdisciplinary and internationally oriented department with particular strengths in the study of German literature, drama, film and media studies, and philosophy. The faculty in the Department conducts research in multiple fields and teaches cross-listed courses in various departments and programs across the university, including the Comparative Literature Program, History, the Jewish Studies Program, Media Studies, the Program in Medieval Studies, Religious Studies, and Women, Gender, and Sexuality Studies. The German Department has especially strong ties to Comparative Literature, History, European Studies, and Media Studies. Besides our graduate courses on literary theory, many of our courses, graduate and undergraduate, relate German literature to other European or world literatures. Ph.D. students have the opportunity to pursue a Certificate in Comparative Literature or a Graduate Certificate in Media Studies. Undergraduate students may pursue a major or minor in either German literature or interdisciplinary German Studies (with a concentration on German history, philosophy, politics, film, or art history, among other possibilities). Historically, the German department has been distinguished by its innovation. It established the first German graduate student conference in the nation and the first language house at UVa, and it designed a widely imitated model for the Ph.D. program. Our department is further distinguished by the strength of our international connections. Each year, the German Department also invites a Max Kade Visiting Professor from Germany to spend one semester at UVa. 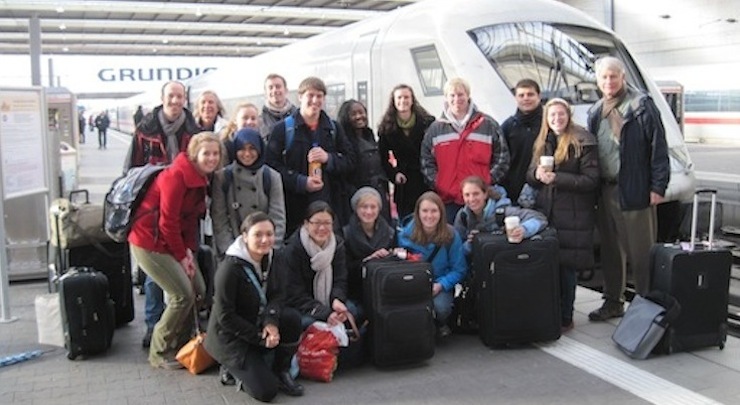 Our department offers students many opportunities to study abroad. Undergraduate students participate in our popular Berlin program in the winter "J-Term," and in our semester- or year-long exchange programs with universities in Berlin, Jena, Dortmund, and Freiburg.